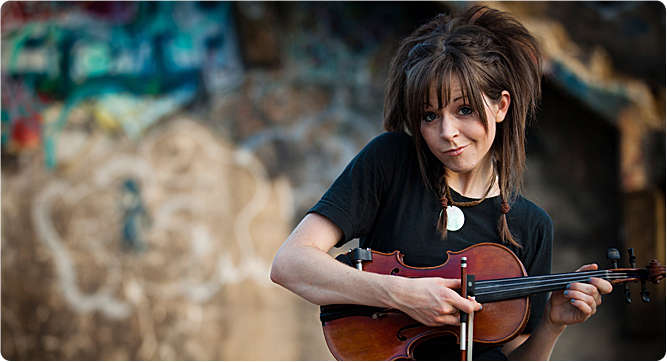 A forte for the violin, quirky style, and funky dance steps draw millions—and millions—of YouTube views for BYU student Lindsey Stirling. Read more in BYU Magazine and watch her in action. Bottom of the Ninth, an interactive iPad app created by animation professor Ryan Woodward, is the first comic book of its kind. Check it out. Two Words, Sounds Like . . .
Four languages, 100,000 app downloads, and 2,000 stores—see how a game by two BYU alums got onto the Today Show and into Barnes & Noble. Watch BYU football's new commercial and get hyped for the season's biggest matches, from Boise State to Notre Dame. Get the scoop in the season prospectus. Find BYU's six most-viewed speeches of all time—and access a trove of more than 1,000 devotionals and forums—on the new BYU Speeches website. European Economic Chamber's Fadoul Mazzawi will speak at BYU on Aug. 6 about an Arab Christian family in Israel. Watch Los Angeles Times bureau chief Barbara Demick discuss her book on North Korea, Nothing to Envy. In BYU's Speech and Language Clinic, grad students perform therapy alongside licensed speech pathologists. The BYU A.R.T.S. Express conference gave teachers fresh ideas on how to weave the arts into their classes. As a newly appointed Fulbright specialist, faculty member Macleans Geo-JaJa is headed to Tanzania. See why. See what teacher education professor Eula Monroe shared and learned at a conference in Thailand. Get to know Martin Hickman,the first dean of the College of Family, Home, and Social Sciences. Using monkey photos, a BYU psychologist is uncovering new insights on how infants process faces. Family life professor Larry Nelson studies emerging adults (ages 18 to 29). Read his advice on parenting your emerging adult through the college years. Looking for a summer read? Check out overviews of the latest books authored by faculty members in the College of Family, Home, and Social Sciences. Recent illustration-program grad Mary Sauer won Best of Show in an international portrait competition. The BYU Chorale will perform its final concert of the summer on Aug. 2 at 7:30 p.m. The event is free. In its last year as a daily newspaper, the Daily Universe won 10 awards from the Society of Professional Journalists. BYU Magazine explores the film program's success in fiction—telling stories of a recluse, an action figure, and an exile. Can you name this influential Russian? Check out profiles of Russians, both famous and infamous. Five BYU students won Critical Language Scholarships, taking them to Russia, Tajikistan, and Morocco. Student Rachel Tui Smith's master's work focuses on helping missionaries teach English around the world. In a college bowl that pits universities against each other in food-science trivia, BYU holds the most national titles. Students participated in a special wreath-laying ceremony at Arlington National Cemetery's Tomb of the Unknowns. Associate dean Patricia Ravert spoke about persistence, patience, and posies in her July 10 devotional address. Get to know faculty member Debbie Edmunds and the life experiences that she says make her a better teacher. Chemistry professor David Dearden has broken new ground in his field with a novel technique for measuring molecules. Stats professor Gilbert Fellingham led classes on cran, arr, and more at the BYU Summer Institute of Applied Statistics. A composite photo made using images from BYU's West Mountain Observatory was NASA's Astronomy Picture of the Day. Four BYU alums received $30,000 National Science Foundation fellowships. Read about their research. See the vehicle that reached 1,135 miles per gallon and won BYU second place at its first super-mileage competition. The White House honored engineering professor Christopher Mattson with its highest award for young researchers. BYU was recognized as one of the nation's leaders in cybersecurity education, thanks in part to a new Fulton College hire. Junior Braden Hancock received the top scholarship from the American Society of Mechanical Engineers. Watch Professor Elizabeth Clark take on the distinctiveness of religion in light of recent controversies. Law student Chase Hansen is completing an externship this summer in Kazakhstan. Watch his YouTube updates. Read Professor David Moore's op-ed in the Jurist on the Supremacy Clause and international law. Alum Mark Atuaia was hired as an assistant to BYU's athletic director of student services and will serve as a mentor and liaison for student athletes. For teens, fun at home with dad is more important than pricey vacations. See what activities are best. The Marriott School has added another associate dean, Lee Perry, to oversee research, placement efforts, and more. School of Accountancy director Steven Glover received two research grants from the Center for Audit Quality. Forbes named Provo the best place for business and careers, due in part to BYU and the city's robust job growth. A BYU professor and an alum helped discover a Samson mosaic in an ancient village. With Vocal Point shows and 1,000-plus classes, Education Week is hard to pass up. Find out how to better skip a rock—and see how it can help solve engineering problems. See what Civil War artifacts the library is pulling out for a new exhibit.